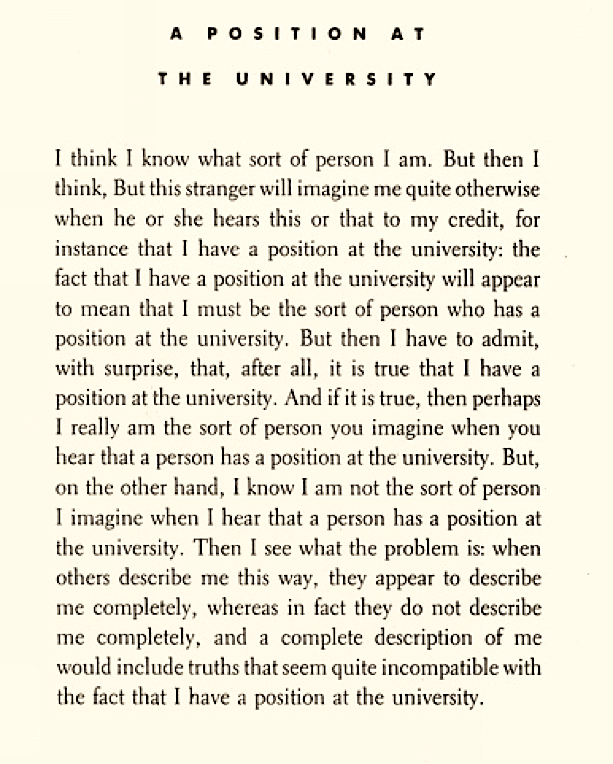 Lydia Davis, "A Position at the University"
PoemTalk finally goes squarely at the question of authenticity, and - wouldn’t you know it? – we do so through a piece that is not in any conventional sense a poem. Lydia Davis’ “A Position at the University” (published with other similar short prose pieces in Almost No Memory) suggests to Jessica Lowenthal that on this day our show was “PoemProseTalk.” Fair enough. Is it a very short story – in the mode of what we call “fiction”? Not really. Is it a poetic parable in prose? (It struck Al at one point as very much like a pondering paragraph from Wittgenstein’s Philosophical Investigations.) Thank goodness we brought sociologist David Grazian along. David observes that this piece is like an ethnographic field note. A field note that observes the following: In daily life, authenticity functions the way imagination does. What advantage is derived by writing about authenticity in this linguistically circular manner, in the grammar of mild-seeming discontent? 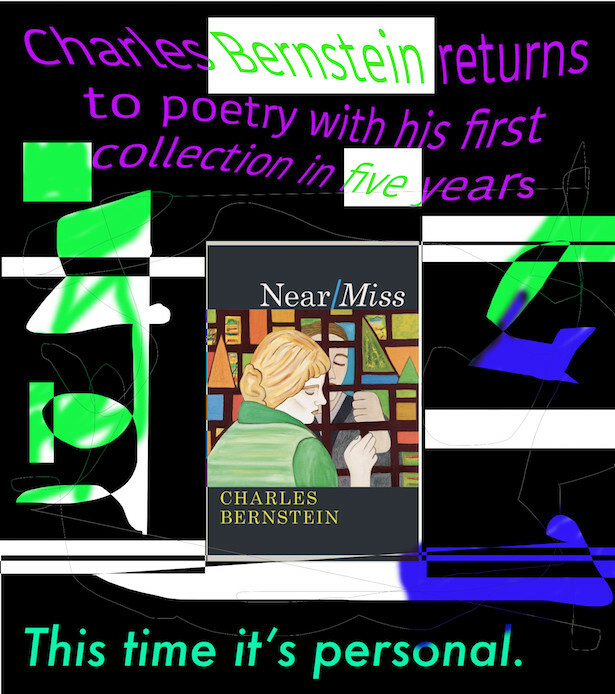 Well, for one thing, it stipulates a poetics; the language of the piece makes us acutely aware as we read or listen that anxiety is the close kin of identity, because identity-naming is always partial whereas the named/identified subject is always hoping for wholeness. That discrepancy – that difference – creates a weird aura, and perhaps this is why Adrian Khactu senses that this piece belongs in the category of mundane SF, the newish sci fi mode in which there are no monsters, scientific abnormalities, cruel transformations. Perhaps the cruelest transformation is what happens every day when a person who thinks of herself in one way is assumed to have a “position” otherwise. 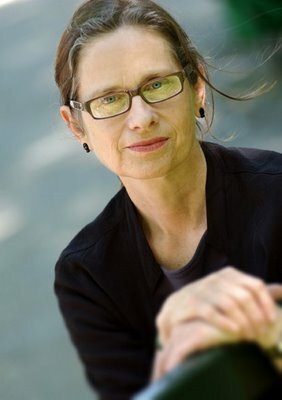 Here is a link to PennSound’s Lydia Davis page, and here is a link to the recording of her reading “A Position at the University” at the Kelly Writers House in 1999. And here is a link to the text. At left, left to right: David Grazian, Jessica Lowenthal, Adrian Khactu. The director and engineer for this episode of PoemTalk was James LaMarre, and our editor, as always, is Steve McLaughlin. We're always grateful to Mark Lindsay, too, who on this occasion bailed us out of some sort of technical difficulty, major for us, minor for him. 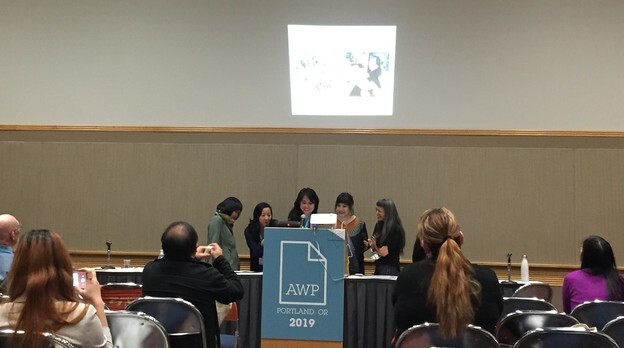 PoemTalk finally goes squarely at the question of authenticity, and — wouldn’t you know it? — we do so through a piece that is not in any conventional sense a poem. Lydia Davis’s “A Position at the University” (published with other similar short prose pieces in Almost No Memory) suggests to Jessica Lowenthal that on this day our show was “PoemProseTalk.” Fair enough. Is it a very short story — in the mode of what we call “fiction”? Not really. Is it a poetic parable in prose? (It struck Al at one point as very much like a pondering paragraph from Wittgenstein’s Philosophical Investigations.) Thank goodness we brought sociologist David Grazian along. David observes that this piece is like an ethnographic field note. A field note that observes the following: In daily life, authenticity functions the way imagination does. What advantage is derived by writing about authenticity in this linguistically circular manner, in the grammar of mild-seeming discontent? Well, for one thing, it stipulates a poetics; the language of the piece makes us acutely aware as we read or listen that anxiety is the close kin of identity, because identity-naming is always partial whereas the named/identified subject is always hoping for wholeness. That discrepancy — that difference — creates a weird aura, and perhaps this is why Adrian Khactu senses that this piece belongs in the category of mundane SF, the newish sci fi mode in which there are no monsters, scientific abnormalities, cruel transformations. Perhaps the cruelest transformation is what happens every day when a person who thinks of herself in one way is assumed to have a “position” otherwise.